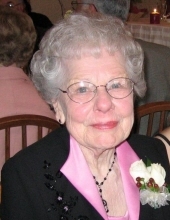 Lucille Catherine Hegge passed away January 6, 2019, at Rennes Health and Rehab Center in Rhinelander surrounded by her family. She was 95. Lucille was born November 10, 1923, at her family’s dairy farm near Verona, Wisconsin, to Catherine and John Winkelman. She attended school in Verona until she married Floyd Bruni in 1939. The couple operated the family farm until 1955. Lucille worked for the Dane County Hospital and in 1963 she and Floyd built the Four Winds Manor Nursing Home in Verona; it was the first nursing home built in Wisconsin from the ground up. After the sale of Four Winds, Lucille went back to school to become an LPN (Licensed Practical Nurse), and worked at a Madison clinic. She retired in the 1970s. Lucille and Floyd, later moved to the Northwoods, traveled to Phoenix in winters, and worked with their daughter and husband at Pine-Aire Resort & Campground in Eagle River. At Pine-Aire, Lucille operated the “Calico Cottage” craft and gift shop, holding regular craft classes for guests, many of whom were young children. Teaching people some of her crafting know-how was one of her many joys in life. She also was the tableside “Salad Lady” at the Logging Camp Restaurant on the resort property. Along with working, Lucille’s great passion was quilting and other needlework. In the 1980s she and friends organized and founded the Cranberry Country Quilters. Besides her quilts being cherished as family heirlooms, many of her quilts remain on display at Riverstone Restaurant today. She was an excellent cook and baker and in later years worked at Riverstone Restaurant plus produced “Granny’s Chocolate Cake” for her grandson’s restaurant, Soda Pops. Years after Floyd passed away, she married Leland Hegge. Lucille and Lee continued working in retirement at Pine-Aire Resort and thoroughly enjoyed traveling together. Lucille was preceded in death by her parents, sisters Alma Bear, Edith McConley, and Evelyn Wiggen, husband Floyd Bruni, second husband Leland Hegge, and her beloved cats Dolly and Abby. Lucille is survived by son Ronald (Lavonne) Bruni of Baraboo, WI, son Carl (Audrey Sue) Bruni of Phoenix, AZ, and daughter Lucinda “Cindy” (Ron) Meinholz of Eagle River, WI. She had eleven grandchildren and multiple great grandchildren. A celebration of life was held at 11am on Tuesday, January 15, 2019 at Gaffney-Busha Funeral Home. Visitation was held one hour prior to the service. Memorial options are pending in Lucille’s name. To plant a tree in memory of Lucille Catherine Hegge, please visit our Tribute Store. "Email Address" would like to share the life celebration of Lucille Catherine Hegge. Click on the "link" to go to share a favorite memory or leave a condolence message for the family.